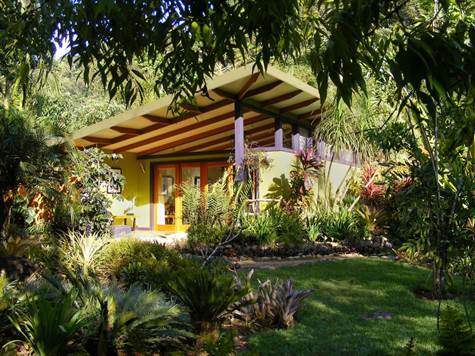 This 125-acre property is situated at the foothills of Chirripó, Costa Rica\'s highest mountain. It\'s in a private and scenic area and features every outdoor amenity you\'d want, such as on-site rivers, flowing waterfalls, swimming holes, lush rainforests, and landscaped hiking trails. The thoughtfully and artistically designed structures have been used as a successful boutique hotel and could continue to be a profitable investment for the right buyer. This property makes you feel like you entered a lush rainforest from the second you enter. It features lush foliage and an amazing canopy of trees, as well as many animals, including spider monkeys and many species of birds. All of the cottages have stunning views of Chirripó Mountain. The main house and studio are currently being used as a live-in and workspace for their residential artists. It includes around 2400 square feet of indoor space and could be renovated into four more bedrooms and bathrooms. The studio features moveable walls for flexibility, allowing better lighting for artists or to add more rooms, or even make it your private residence. The studio currently features a large green wooden island ideal for entertaining. The living room includes a casual and comfortable style, complete with brown leather couches, strobe lighting, and a fireplace to keep warm during the cool nights. It also includes a lounge area with comfortable love seats, where guests can read or converse amongst each other. The master suite includes a king bed, floor to ceiling windows, and a glass-enclosed shower, as well as a private terrace. The exterior of it features a butterfly roof, which lets natural lighting in and circulating air. With the mild temperatures, you won\'t have to pay for air conditioning.